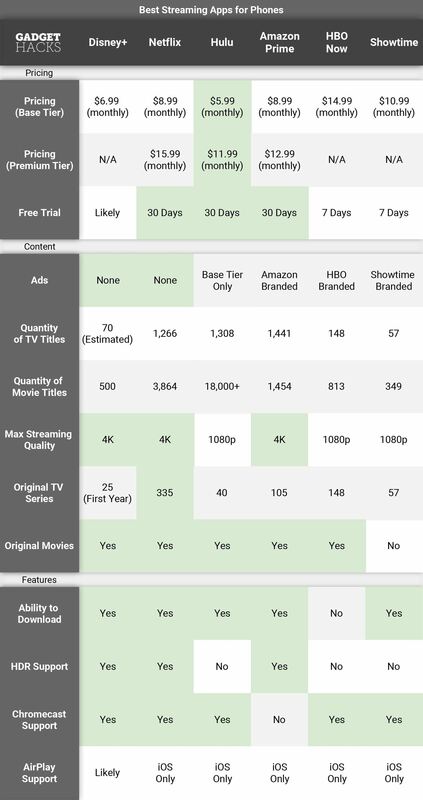 The issue with comparing streaming services such as Disney+, Netflix, Hulu, Amazon, HBO Now, and Showtime is that things really aren't cut and dry. Sure, you can compare pricing, number of titles, streaming quality, and the like, but when it comes down to it, each service provides its own benefits, usually in the form of original content. If you watch HBO religiously, you aren't going to cancel for Disney+. It's the same thing if you love Netflix, Amazon Prime, Showtime, or Hulu original shows and movies. Disney+ will likely be a similar deal. If you want to watch its exclusive content, especially its horde of family-friendly content, you'll want to subscribe. But you also have to think about Apple TV+, Apple's upcoming streaming subscription, which less is known about. If you need to cut out a service or two to make room in your budget for Star Wars, Marvel, and other Disney content, we've plainly laid out all the info we know about Disney+ stacked up against the big names, minus Apple TV+ which we still don't know a whole lot about. If you look at the chart below, you can see how Disney's initial offering will compare to the big five players right now. Disney does a lot of things right — 4K, HDR, no ads, the ability to download for offline viewing, and a wide variety of ways to watch. With 35 confirmed original series and 20 original movies, Disney+ is far behind much of the competition. But those series and movies include new Star Wars and Marvel content, something no other platform will be able to offer upon Disney+'s launch. However, of the 35 original series from Lucasfilm, Marvel Studios, National Geographic, Pixar, and Walt Disney Animation, only 10 are expected to come out in late-2019. Twelve are expected to be released in 2020, four in 2021, and the remaining ones have no estimated release years. As for the original films, Disney states that there will be 10 out before Disney+'s first year is up, with the rest of the titles coming out over the next few years. Check out Disney's press release to see which shows and films will be available within the first year of service. In addition to originals, there's the enormous library of Disney-branded TV series and movies. While not exclusively produced for Disney+, Disney has a giant vault of beloved content, included content from recent acquisitions such as 21st Century Fox (which includes Fox Television and the FX channels). One of the key series Disney said would be on Disney+ is The Simpsons, all 30 season, which is currently on FXX. And soon, Disney+ will be the only place to watch Peter Pan, Snow White, the Pixar classics, and so much more. Really, the selling point at this time is the price. At $6.99 per month, Disney+ is outmatched by none except Hulu. That gets even better when you consider its yearly rate of $70, which equates to $5.83 a month. Unless you're a student using Hulu, that's the cheapest plan on the market, though, not necessarily the plan with the biggest content library. Disney will no doubt increase prices as it accrues more TV series and movies, but locking yourself into a year-long plan is one way to prolong those hikes. Which Service Should You Ditch for Disney+? If you're thinking about getting rid of one of your services to justify subscribing to Disney+, here's the thing — each service is so different. It really comes down to what you watch most and what type of content you need. If you have kids, you rely on services that provide excellent children's programming. Disney+ is obviously a winner here, but so are Netflix and Hulu. HBO has some staples, notably Sesame Street, but definitely isn't the best for kids. And Showtime? Forget about it. Then you need to think about overlapping content. You might find similar shows between Netflix and Amazon Prime, but Hulu will probably offer the most content outside of the Disney sphere (even though Disney owns 60% of Hulu). But what kind of content do you watch? Hulu and Netflix have the most movies, while they and Amazon have a healthy library of TV series. HBO and Showtime are limited in both categories, however, their libraries are made of mostly original content, some of it wildly successful and addictive. Game of Thrones, anyone? At the end of the day, you need to decide what services are worth your time and money. HBO is expensive, worth more than two Disney+ accounts, but is considered to be the king (or queen?) or high-quality original series. Netflix costs even more if you want 4K content. Hulu doesn't even offer 4K content. Which service should you skip? Well, let our chart help you decide what's best for you, as well as all your preferences.